By now you should be aware of the winter storm headed for the Ohio River Valley of the United States. There is only one way to describe how this is going to turn out. This is going to be a mess! The National Weather Service offices in Memphis, Paducah, and St. Louis have upgraded our Winter Storm Watches to Winter Storm Warnings and Ice Storm Warnings. Further east, Winter Storm Watches are being upgraded as the system gets closer. Around the Heartland (Southeast Missouri, Southern Illinois, Western Kentucky, and Northwest Tennessee) it looks as though we are going to see a mix of heavy snow, heavy sleet, and heavy icing in the form of freezing rain. It appears that this will start to move in from the west starting around 7:00pm - 8:00pm give or take a couple of hours. Over the last couple of days, all but one of the models had been indicating copious amounts of moisture in the atmosphere to work with. Late last night the one lone model came in line with all the others. The models are suggesting there could be 1" to 2.5" of moisture to work with. That is a LOT of moisture for a winter storm! If you look at my blog post from yesterday, we had some questions that had to be answered before we could figure out how bad this storm will be. We needed to figure out how much moisture there would be. We needed to determine what the temperatures going up in the atmosphere would be. We then could start to figure out what kind of precipitation we would be getting. Lets take a look at the temperatures going up. 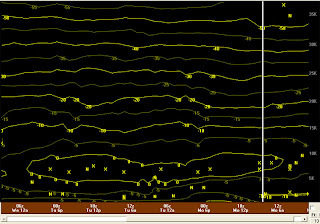 Here is one of the forecast models cross section over Cape Girardeau. Remember that the time reads from right to left. Notice the large area of 0°+ temps sitting around 5,000 feet off the ground. To me, this is hinting more at sleet than snow or freezing rain. What we see falling out of the sky will depend on how thick that layer of warmer air is. If it remains similar to this, we will see sleet. 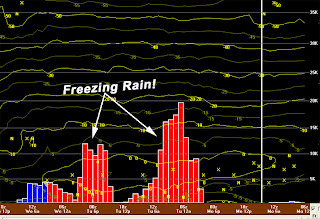 If it thickens, or drops closer to the surface, we will see freezing rain as the frozen precip falls in to the warm layer and melts. Then once it gets near the surface it refreezes as ice. I have had a feeling that this biggest problem with this storm would be ice and my feeling is still the same. Some folks will get some heavy snow, but the ice is flat out crippling as many remember from last February. Here is a look at one of the forecast views from Farmington, Missouri. Notice that it is mainly all snow. (Blue = snow) With the amount of moisture in the atmosphere and it all falls as snow, it isn't out of the question to see a 7"-10" of snow. Further south here is the view of Paducah, Kentucky. Notice all the freezing rain. (Red=freezing rain) For people in Western Kentucky, Northwest Tennessee, and southern sections of Southeast Missouri (Benton, Mo and south) this could be a HUGE ice storm. With all the moisture the computer models are spitting out, it is possible we could be talking over 1" of ice. For friends further to the east in Indiana... 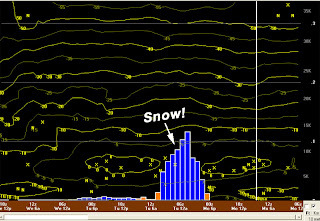 I think there is going to be a band of heavy snow of 6"-8" of snow that runs from Columbus, IN to Indianapolis. If you are south of Seymour (getting closer to Louisville), it is going to be more of an icing issue. Remember... The images I have put on here are computer models. Not reality. There is a lot more that goes in to forecasting than just taking numbers straight from the computer model. We will be fine tuning the forecast as the event nears. So are you ready for this one?